Sabai Technology is a small company based in South Carolina (USA) offering VPN routers and related equipment. For this review I tested out a Sabai VPN Router, VPN Accelerator, and the firmware that comes with these devices, Sabai OS. 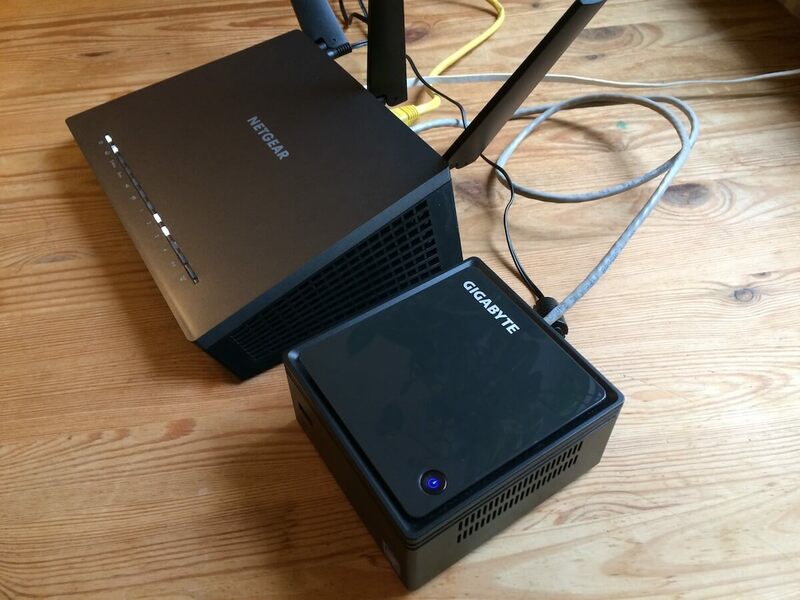 The VPN Router and VPN Accelerator both performed very well in testing. The VPN Accelerator now holds the record for the fastest VPN router I have ever tested, at over 104 Mbps download speed (256-bit OpenVPN). I was also very impressed with the custom firmware (Sabai OS) which is based on Tomato. Sabai OS offers many advanced features such Gateways, which allows you to selectively route every device on your network, a kill switch, and a very user-friendly interface. The support was also excellent and very responsive to my questions. I first learned about Sabai Technology when researching a solution for what I call the VPN router performance problem. This is the fundamental problem whereby all consumer-grade routers have processors that are underpowered for VPN use, which often results in slower speeds. Solution – Sabai Technology solves this performance problem with their VPN Accelerator. The VPN Accelerator (VPNA) is a Mini PC with a high-powered processor to handle encryption/decryption when using a VPN service. The VPNA simply hooks up to a VPN router running the Sabai OS firmware. The router continues to act as the access point for all your devices, while the VPNA does the heavy lifting (encryption) for your VPN. This combination supercharges VPN performance. Sabai Technology is a company specializing in VPN routers and related equipment. The company is based in Simpsonville, South Carolina (United States) and was founded in 2010 by William Haynes. All support is handled in-house by professional technicians (no third parties). Sabai Technology offers a great lineup VPN routers, network equipment (switches, adapters, cables, etc. ), service options, and of course, their custom Sabai OS router firmware (based on Tomato). Additionally, they also offer a nice selection of bundle packages with various equipment for different uses (this will save you money from buying everything separately). You can see the full lineup of products on their website. Sabai OS is built on Tomato firmware. I found the VPN router firmware to be user-friendly while also offering some great features. Kill switch – Block all internet connectivity if the VPN connection drops. 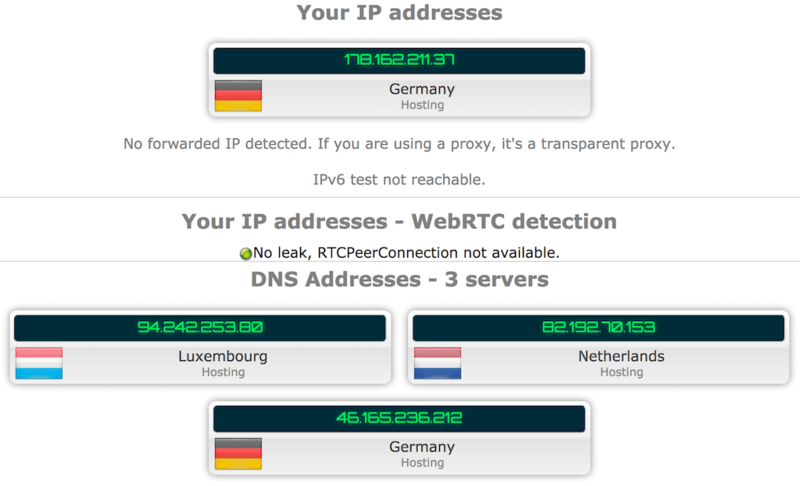 Selective routing – Select which devices go through the VPN and which use your regular (local) internet. User-friendly interface – Using Sabai OS either with the router or VPN Accelerator is fairly straight-forward – even if you are new to working with VPN routers. Gateways – The Gateways feature allows you to select how different devices are routed. In other words, you can choose which device will use the VPN, or the regular (unencrypted) internet. Below is a screenshot of the Gateways features with the VPN Accelerator and the VPN router. You can see that with every device, I can select whether it connects through the Local network (L); VPN router (V); or VPN Accelerator (A). You can also set a default connection method (gateway) to be used for all devices. The Gateways feature will allow you to selectively route the traffic for every device. It will also work as a kill switch. Kill switch – The Gateways feature also acts as a kill switch for your VPN router and/or VPN Accelerator. In other words, if a specific Gateway drops (such as the VPN router’s connection to a VPN server), traffic will be blocked for all devices assigned to the VPN router. This keeps you safe and helps prevent any IP address leaks. I found this feature to work perfectly in my testing. Note – If you already own a router that is compatible with Sabai OS, you can purchase the firmware license as well as various support packages. See the website for a list of compatible routers and firmware options. 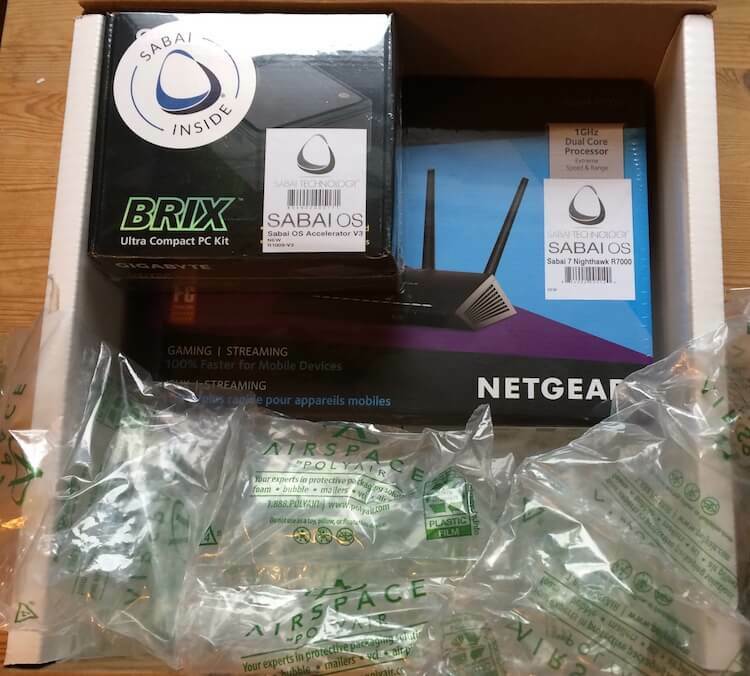 Ordering a VPN router on the Sabai OS website is a simple and user-friendly process. After selecting the items you need you will be taken through a checkout process where you create an account, select shipping, billing, and payment. Shipping – My order was placed on Thursday, November 30th, and it shipped the next day on Friday, December 1st. I received a FedEx shipping confirmation email, which gave me the tracking number and the expected delivery date. The package was shipped from their office in South Carolina to my location in Europe (international order). To my surprise, the package arrived in three days – on Monday, December 4th. I have ordered many items from the US and this is the fastest shipment I have received for an international order (especially considering it was over the weekend). Even with international shipping from the US to Europe (over the weekend), the router arrived in just three days. Everything was packed well and there were no problems with the VPN router or VPN Accelerator inside. The VPN Accelerator and VPN Router were packed well (no problems). Sabai Technology did a great job with packing the equipment and shipping it in a timely manner. I found that getting the VPN router setup and running was easy to do because the VPN routers come pre-configured with the Sabai OS firmware. The Sabai OS firmware is user-friendly and easy to navigate. There are also basic instructions cards in the box, which includes all the important details. Installation is simple regardless of your experience level (and they also provide remote one-on-one assistance if you want it). Sabai Technology’s website has step-by-step instructions for setting up the VPN router with OpenVPN here. Connect the power cord from an electrical outlet to the back of the Sabai VPN router. Ensure the power button is switched on. Connect an ethernet cable from one of the LAN ports on your existing router/modem to the Internet/WAN port of the Sabai VPN router. Connect another Ethernet cable from the Ethernet port on your computer to the first LAN port of the Sabai VPN router (or connect wirelessly to Sabai24). 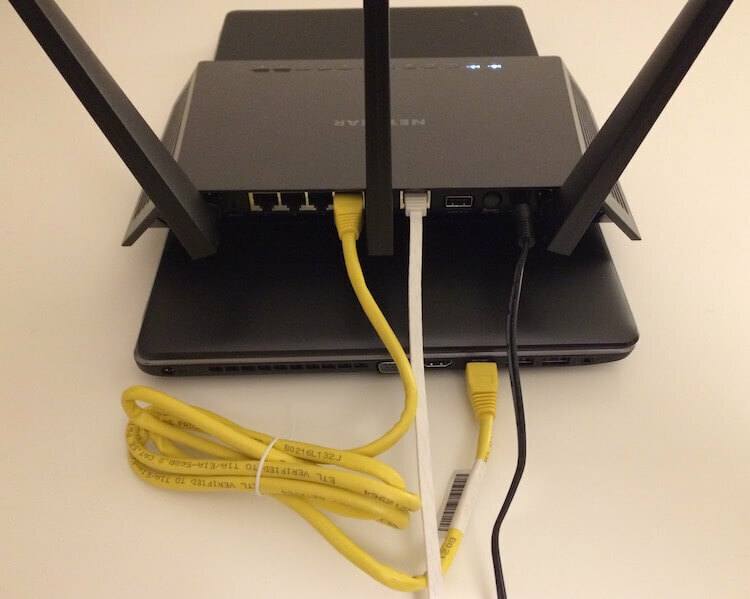 The yellow ethernet cable connects the VPN router to my computer and the white ethernet cable connects to the VPN router to the existing router/modem. Restart your network. Power off your existing router/modem. Then Power off the Sabai VPN router. Wait two minutes. Then power on the existing router/modem. And lastly, power on the Sabai VPN router. The next step is to access the Sabai OS VPN router admin area and import the OpenVPN configuration file that your VPN router will be using. Sabai OS provides a great overview guide here to walk you through the steps. First, access your router admin area by entering 192.168.199.1 into your URL bar in a standard internet browser. You can then log in to the admin area with the username and password provided on the instruction card of your router box. Now you will need to have an OpenVPN config file ready for a specific VPN server you want to use. For this setup, I used VPN.ac. However, this should work with any VPN provider that gives you the OpenVPN config files for their different server locations. 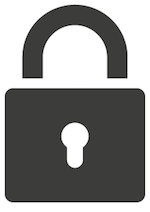 In this example the OpenVPN 256-bit encryption cipher with a nearby server in Germany. Now select the following: Network > OpenVPN and then select the OpenVPN config file (server location) you wish to use and upload the file to the router by clicking Open. 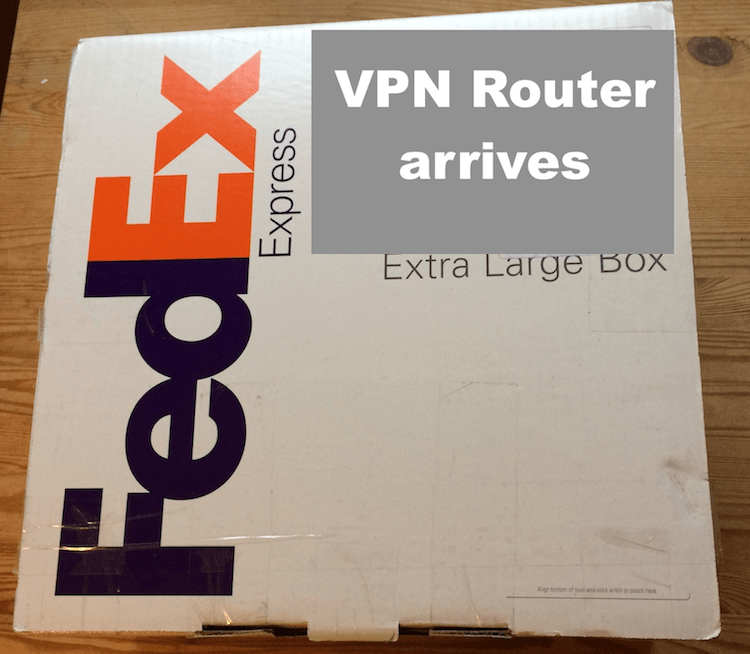 Now that you have the OpenVPN file uploaded to your router, you will probably need to add your username and password. Some VPNs may also require you to manually add the ca.crt file or other files. For VPN.ac, you only need to add your username and password. Now directly under the config file click Show File > Edit and then add your username and password. After doing this click Done and then Save. At this point you are ready to activate the VPN connection. Simply click Start, and then wait a few seconds until the connection is established. After a few more seconds, you will see a confirmation of your VPN connection and new IP address in the top right corner. That’s it! Sabai OS is easy to get going in minutes. And if you want to switch VPN server locations, just import a new config file, add your username and password, and connect. You can also verify that everything is working correctly by running a VPN leak test. No leaks using VPN.ac on a Sabai router. Note: you can also manually configure back-up DNS servers to use directly in your router admin settings area. This will further protect you against any DNS leaks. The Netgear Nighthawk AC 1900 (R7000) VPN router did well in speed testing. The main factor with router performance is the CPU (processing power). The CPU for the Netgear Nighthawk R7000 router is a dual core 1 Ghz processor. I expected maximum speeds to be around 35 Mbps, which is normal for a 1 Ghz processor (as explained in the VPN router guide). Good speed results for a VPN router with a 1 Ghz dual core processor. My baseline speed using a VPN on my computer and connecting to the same server was about 108 Mbps. My speed without any VPN was about 115 Mbps. Now let’s take a look at the VPN Accelerator and how it supercharges VPN router performance. The VPN Accelerator is a mini PC that works with your existing VPN router to maximize speed. As we discussed above, the biggest problem with all consumer-grade routers is that the processor is underpowered for handling encryption with a VPN. The VPN Accelerator (VPNA) solves this problem by taking over the heavy lifting (processing) from the VPN router. This means that your router will still act as the access point with the network, but the VPNA will handle all the VPN encryption. The VPNA I tested for this review was equipped with an Intel Celeron N2807 processor, capable of burst speeds up to 2.16 Ghz. Here is the VPN Accelerator I tested next to the Netgear Nighthawk VPN router. 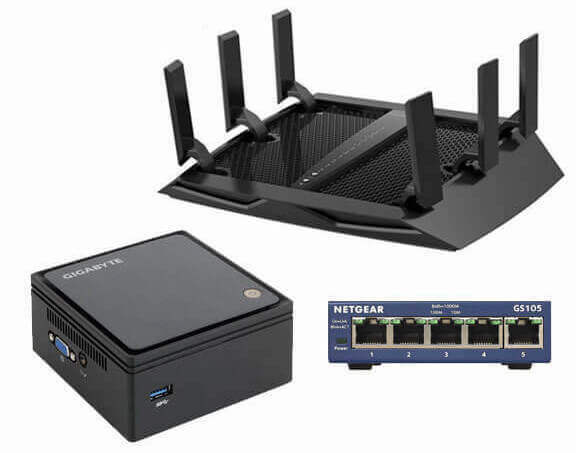 The Netgear Nighthawk R7000 router with the VPN Accelerator – a good pair for speed. The VPN Accelerator is my top recommendation for anyone wanting to achieve the maximum performance with a VPN router (speed tests below). Now we will go over setup instructions. Just like with the Sabai VPN router, getting the VPN Accelerator setup was quick and easy. There was a basic instruction card in the box giving an overview of the VPNA and a simple step-by-step installation process. 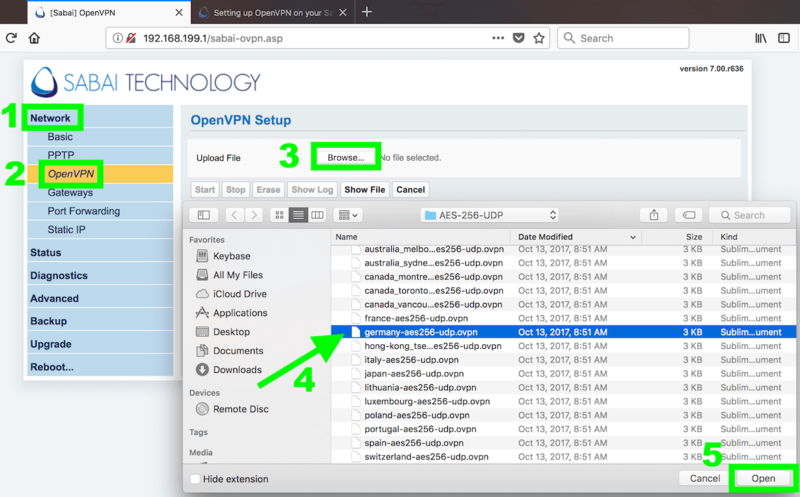 Sabai Technology also has step-by-step instructions for configuring OpenVPN on the VPN Accelerator here. Check to make sure the mini USB drive that came with the device is firmly in place. Insert the VPNA’s adapter into the DC-IN port and plug it into a power outlet. Then press the power button on the top of the VPNA. Connect an ethernet cable from the ethernet port on your VPN Accelerator to a LAN port on your Sabai VPN router. At this point you can log in to the VPN Accelerator admin area, which should be at 192.168.199.2. Login details are printed on the installation card that comes with the VPNA. After logging in, click on VPN > OpenVPN Client. Then, just like before with the VPN router, select the OpenVPN config file you wish to use, upload the file, and then edit the file to include your username and password. You can add your username and password by selecting Edit Config and then Save after you have added your VPN credentials. Now that you have your OpenVPN config file loaded, you can connect. Simply click Start and then wait a few seconds for the connection confirmation at the top right corner of the admin screen. After you have both your VPN Accelerator and VPN router running, you need to select which device your computer (and anything else) will use. Again, this is very easy to do with Sabai OS, whereas with other router firmware it can be quite challenging (creating custom rules, IP tables, etc.). Use the Gateways feature to selectively route your devices. In the screenshot above, I selected the VPN Accelerator as the default. (The VPN is referring to the VPN router.) You can selectively route as many devices as you want with the Gateways feature. Note: The Sabai VPN Accelerator and VPN router can both be connected to different VPN servers at the same time. You can then use the Gateways feature to select how your different devices should connect. Conclusion on setup – Overall the VPN Accelerator was easy to setup, although it did take a bit of configuring to get everything working the way I wanted it to. The VPN Accelerator is built to give you the fastest VPN router performance right out of the box. I was very impressed with the results. My download speed using the VPN Accelerator (connecting to the same nearby server) was 104 Mbps, making this the fastest VPN router I have ever tested. The VPN Accelerator gave me the fastest VPN router speeds I have seen. This is the solution for a high-performance VPN router. This is blazing fast for a VPN router. The fast speeds were also very consistent around 100 Mbps with the VPN Accelerator using nearby servers (low latency) with VPN.ac. If you are looking to maximize your VPN router performance, this is the device to have. The processor is capable of burst speeds up to 2.16 Ghz, but typically runs around 1.8 Ghz (according to Sabai OS support). We are currently working on a high-end VPNA, that runs a 6th generation Intel Core i7-6770HQ processor (2.6 GHz up to 3.5 GHz Turbo, Quad-Core 6MB cache). You can get more details on their website. The VPN Accelerator paired with the Netgear router takes the prize as the fastest VPN router I have tested. Hitting speeds over 100 Mbps (with 256-bit OpenVPN) is simply not possible with the current consumer-grade routers and their underpowered processors. While the Sabai VPN Accelerator is somewhat expensive, you could pair it with a cheaper router, and still get the maximum performance results, thanks to the VPNA. All of the speed tests in this review were done with VPN.ac. In general it is a good idea to experiment with different factors in order to optimize performance. 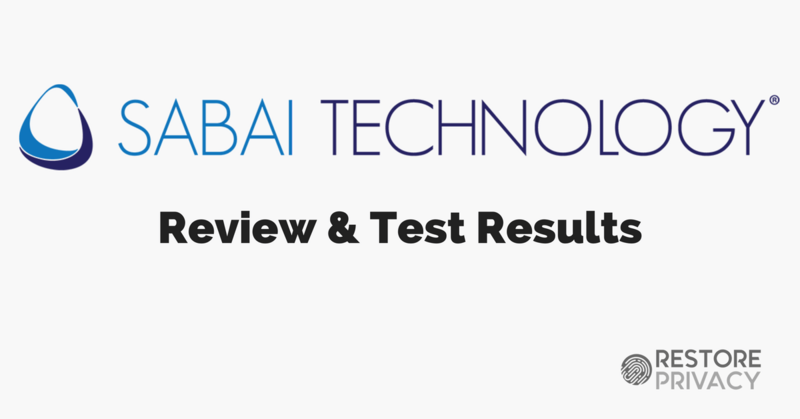 Sabai Technology told me they actively monitor for any security issues or vulnerabilities. If something is found, their technicians immediately work to identify the issue and update the firmware. In a given year, they may update the firmware three to four times, based on the needs. You can find more security tips, blog posts, and informative guides on the Sabai website. The remote technical assistance option is available for setting up your VPN router or VPN Accelerator, flashing your existing router with Sabai OS firmware, and any other firmware updates. 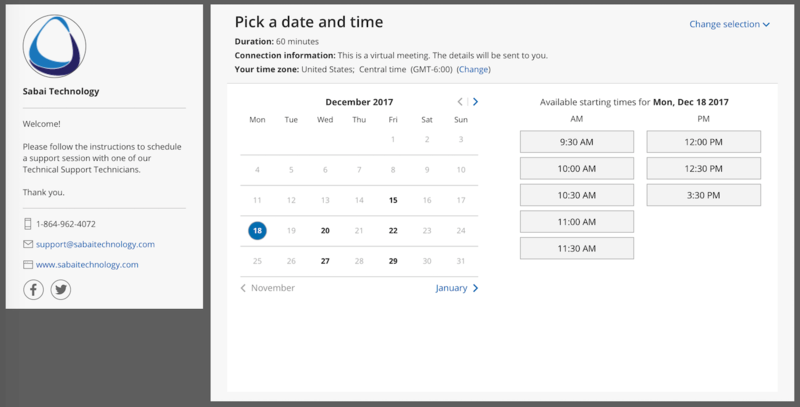 You can schedule a session directly on their site (see support). Sabai Technology offers direct remote assistance for their customers. I had a bit of trouble getting the VPN Accelerator configured properly and sent a few different questions to their technicians. However, after updating a file, everything worked well. All replies were answered within a few hours of my email (during their business hours). Overall I would rate the support as excellent. One drawback with getting a custom pre-configured VPN router is that the price will be higher than your standard (non-configured) router. This is to be expected, however, simply because configuration, support, updates, and testing are all being factored into the price. For comparison, Flashrouters (another source for pre-configured VPN routers) limits you to a 90-day hardware guarantee and 30-day customer satisfaction guarantee. If you have a router that is supported by Sabai OS, you can simply purchase the firmware license and flash the router with assistance from Sabai technicians. If you want the maximum performance for a lower price, you could pair the VPN Accelerator with a lower-cost router. This would give you all the speed/performance benefits of the VPN Accelerator, along with a decent router to act as the access point. If you wanted the maximum speed for both your VPN router and the VPN Accelerator, you could go with the Unlimited VPN Speed bundle, which gives you the fastest router, the VPN Accelerator, and 5-port gigabit ethernet switch. This is the Ultimate VPN Speed bundle from Sabai Technology. For more details on pricing and products, check out their website here. Overall I was very impressed with the performance of the VPN Router and VPN Accelerator I tested for this review. The VPN Accelerator is the best out-of-the-box solution I have come across for maximizing your VPN router speed. The VPN router, on its own, also did quite well in testing. The Sabai OS firmware is a solid choice for those seeking a user-friendly interface that also offers advanced features and configuration options, along with regular security updates. Getting your Sabai OS router setup with a VPN service is very easy to do with this firmware (easier than most other options). I also found the support to be top-notch. All of my questions were answered quickly by the technicians in a friendly and professional manner. Given that many people become frustrated and overwhelmed configuring a VPN router on their own, having access to responsive and professional support is key. While the price is somewhat more expensive than a standard router, the Sabai VPN router and VPN Accelerator still earn a strong recommendation. The custom Sabai OS firmware, advanced features, and helpful technical support make Sabai Technology a great option for VPN routers, firmware, and related hardware.